at its price its quite remarkable." Sound "The Bravo 2.3 nailed the midrange. It produced a sonic portrait densely packed with information and replete with the intense tonal color for which SET amps and integrateds are celebrated. But unlike some SET products, theres nothing wimpy about the Bravo 2.3; it was very dynamic and punchy," displaying "sumptuous tonality that depicted instrumental and vocal sonorities with great detail and beauty." Features "Audio circuits dont get much simpler": "The signal enters, goes through a single tube that serves as gain stage and driver stage, then enters the output stage." "The Bravo 2.3 uses two huge 6C33 triode tubes in a single-ended-output configuration to produce a claimed 18Wpc" along with "two 6J4P driver tubes and two 5A4 rectifiers (although 5Z3P rectifiers were specified). The use of a separate rectifier tube for each channel means plenty of current will be available." Use "In use, the Bravo 2.3 displayed a few quirks. It produced a distinctive odor -- not unpleasant, but when I walked into the room where the amplifier was located, I could smell an odor of electronic equipment. Also, this integrated got rather hot to the touch." "I might wish the remote control had a little more flexibility, but volume control is the only really essential remote function, and the Bravo 2.3s tiny remote performed that operation flawlessly." Value "If I say the Bravo 2.3 achieved 90% of the PX-25/LS26s sound for 15% of its cost, that should be doggone amazing. The Law of Diminishing Returns was definitely hard at work here, and was greatly in the favor of the Bravo 2.3." The advantages of integrated amplifiers -- one fewer pair of interconnects needed, only one shelf required for placement, an ideal electrical match between the control section and the power section -- have been well chronicled. However, a factor I havent seen discussed very often is the inherent simplicity of the signal path. With audio electronics, simpler is better. Each amplification stage an audio signal passes through adds noise and distortion. Thats just a fact of life. In a full-up audiophile system, with a separate amp and preamp, the signal enters the preamp, where it passes through two or possibly three stages of amplification and buffering. Then it exits through the output jacks, enters an interconnect cable via an RCA or XLR connector, traverses the interconnect cable where it may pick up electromagnetic interference, exits the interconnect cable via another connector, and then enters the power amp via its input jacks. Once inside the amp, it traverses a voltage-gain stage, a driver stage, and then the output stage. That complex signal path cant help but add noise and distortion. Its a wonder a system based on a preamp and power amp sounds as good as it does. With an integrated amp like the $1949 USD JAS Bravo 2.3, things are much simpler. The signal enters, goes through a single tube that serves as gain stage and driver stage, then enters the output stage. All connections are hard-wired inside the amplifier chassis, where they are protected from electromagnetic noise. So the Bravo 2.3 should start off with an enormous advantage. Audio circuits dont get much simpler. As this product's full name, "JAS Bravo 2.3 6C33 Single-Ended Class A Integrated Amplifier," suggests, the Bravo 2.3 uses two huge 6C33 triode tubes in a single-ended-output configuration to produce a claimed 18Wpc. Because each 6C33 reproduces the entire output waveform for its channel, it must run in class A. The Russian-made 6C33 tube has been rumored to have been used in MIG fighters. More important to audiophiles, its also used in highly regarded amplifiers from Joule Electra, Lamm, and Balanced Audio Technology; so its obviously capable of producing superb sound. The Bravo 2.3 also uses two 6J4P driver tubes and two 5A4 rectifiers (although 5Z3P rectifiers were specified). The use of a separate rectifier tube for each channel means plenty of current will be available. This was my first encounter with the 6J4P tube, which is built on an octal base and looks a lot like a 6SN7. However, unlike the 6SN7, the 6J4P is apparently a pentode tube. The Bravo 2.3 has a very functional layout. Up front is a silver brushed-aluminum front panel. Behind that, the tubes are located in a central section topped by a layer of acrylic. A tube cage protects children and pets from the hot tubes. Since I didnt need to use the tube cage, I left it off for the review, which made the Bravo 2.3 far more attractive. In the rear, a full-width transformer cover protects you from grabbing a high-voltage wire, and a layer of nicely finished wood adorns the top of the cover. 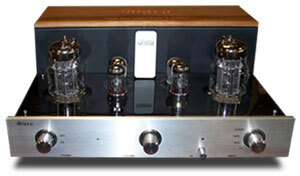 Laser-engraving on the wood panel proclaims that the integrated is a "Bravo High End Valve Tube Amplifier." The acrylic layer and the wood trim not only enhance the appearance, they also damp vibration. I thought the Bravo 2.3s appearance was first-rate, almost the equal of the gorgeous Raysonic SP-100 I wrote about in early 2006. A small knob between the volume control and input selector sets the feedback -- an unusual feature. Full counterclockwise setting means there is no feedback, while full clockwise applies 6dB of feedback. A small remote control changes the volume setting only; theres no remote muting or input selection. On the rear are four pairs of RCA jacks for the inputs and binding posts for 4- and 8-ohm speakers. I was glad to see that the binding posts were all metal instead of the "WBT-style" posts used for many Chinese products and have a habit of shedding their plastic covers under frequent use. An IEC connector lets you use the power cord of your choice. The stock cord is a scrawny-looking computer-grade number, but because we evaluate equipment as we receive it, thats what I used for most of the review. The user manual recommends a silver power cord, but given the price of precious metals these days, one of those might cost more than the Bravo 2.3. Just for grins, I briefly tried pure-copper Eichmann speaker cables, and they produced a lovely burnished sound but didnt do justice to the high frequencies. JAS Audio importer/distributor Stephen Monte told me he, too, had found that some silver cables sounded shrill and personally used oxygen-free copper speaker cables with the Bravo 2.3. Elsewhere in the system, I used silver interconnects from TG Audio and Crystal Cable for the inputs from my CD and tuner respectively. And although all my listening impressions were formed while using the stock power cord, I couldnt resist trying an aftermarket cord. I briefly substituted a Blue Marble Audio power cord and heard somewhat deeper bass that had greater impact. I didnt try other power cords, but there are plenty of good ones available. The Bravo 2.3 easily drove my 97dB-sensitive Opera Audio M12 Barque speakers. Although less powerful amps normally work well with the speakers, sometimes they will clip if I get into a headbanging mood. I also tried the Bravo 2.3 with my 101.5dB-sensitive Second ReTHM speakers, which make great noise detectors, and Im pleased to report the Bravo 2.3 was very quiet. In use, the Bravo 2.3 displayed a few quirks. It produced a distinctive odor -- not unpleasant, but when I walked into the room where the amplifier was located, I could smell an odor of electronic equipment. Also, this integrated got rather hot to the touch. The tubes themselves didnt get excessively hot, but the chassis and control knobs were surprisingly hot after the amplifier operated for a couple of hours. They wouldnt burn you, but you might be surprised when you grasped one of the knobs to change volume or select a new source. Finally, when I switched to one of the unused inputs, there was an increase in noise/hum. Some shorting plugs in the unused inputs would probably eliminate this problem. But SET amps are not without weaknesses. They tend to lack bass and treble extension (though not always -- I think this depends on the quality of the output transformers), and they usually dont produce much power, so they probably arent the best choice to drive speakers of average sensitivity or lower. Within their power envelope they tend to be quite dynamic; however, if you push them too hard, they run out of headroom and then clip. Lets see how the JAS Bravo 2.3 lives up to these traditional SET strengths and weaknesses. To start with, the Bravo 2.3 nailed the midrange. It produced a sonic portrait densely packed with information and replete with the intense tonal color for which SET amps and integrateds are celebrated. But unlike some SET products, theres nothing wimpy about the Bravo 2.3; it was very dynamic and punchy. In heavy rotation these days is the CD Rodrigo Concierto Aranjuez with Göran Söllscher on guitar and the Orpheus Chamber Orchestra [Deutsche Gramophon Entrée 474 174-2]. The Bravo 2.3 reproduced the guitar in the title piece with an opulent tone, completely developed overtones, and copious detail that let me hear all the notes in this complex piece. Of course, some of the credit for that goes to soloist Söllscher, the only guitarist whom Ive heard who actually plays all the notes. I also heard some of the extraneous noises that occur when a guitar is played. They weren't obnoxiously loud but there in the background, affirming the effort it takes to play guitar well. The recordings dynamic range was unusually wide, so if I set the volume in the introductory parts to be easily heard, the climaxes may overwhelm. Most recordings of this piece dont have such a wide dynamic range, but it didnt faze the Bravo 2.3. So how did the Bravo 2.3s soundstage stack up? Was it "palpable"? Indeed it was. The depiction and horizontal placement of performers on the soundstage were superb, precisely pinpointing their locations. The front-to-back dimension was almost as well defined, but lacked the micrometer-precision of the side-to-side localization. Because the Tallis Scholars performance of Allegris "Miserere" on the CD Allegri Miserere [Gimmell 454 939-2] has a very spacious soundstage with well-defined depth, its my benchmark for how a component handles spatial dimensions. The Bravo 2.3 showed me where each singer in the group was located in the area between the speakers, almost as if I could point to his or her location in front of me. There was a definite sense of depth, but I couldnt pinpoint performers front to back as well as I could their horizontal locations. Actually, if I hadnt heard some amplifiers do the depth thing even better, Id probably never have realized improvement was possible. So far, the Bravo 2.3 has shown typical SET strengths. However, the Bravo 2.3s treble extension did not conform to the standard SET model. Instead, it was quite extended. Orchestral chimes had the ability to produce a penetrating high resonance that floated over a symphony orchestra in full cry, easily heard in the last row of seats in a concert hall. The Bravo 2.3 captured the chimes sound with great realism. On Argentos "For the Angel Israfel," as played by Eije Oue and the Minnesota Orchestra [Reference Recordings RR-100CD], the opening chimes initial transient and subsequent decay were distinctly shaped by the Bravo 2.3. Bass extension wasnt shabby, either, although Ive heard very slightly deeper bass in my system. However, on Chris Joness CD Roadhouses and Automobiles [Stockfisch SFR 357.6.27.2], the midbass had lots of sock, which will satisfy many listeners. Ive discussed the Bravo 2.3s macrodynamic prowess, but its handling of microdynamic shifts in loudness was equally commendable. This integrated amp sounded bouncy, with lots of dynamic life and pep. It tracked the continuously changing volume levels on "Folia: Rodrigo Martinez," played by Jordi Savall and associates [AliaVox AV 9805] quite accurately, re-creating the full measure of this performances verve and vigor. A surprising number of components flatten out the dynamics, destroying the energy the performers bring to this captivating piece. Not the Bravo 2.3. The feedback control lets you change the JAS Bravo 2.3s negative feedback, tailoring it to your tastes or whims. Curmudgeon that I am, I sometimes wonder why such controls are necessary. Cant the designer just find the best-sounding feedback setting and hard-wire it into the circuit? But I dutifully experimented with the Bravo 2.3s feedback control to see if it was useful. When I increased the feedback, the gain also increased, and the sound became a smidgen more incisive. Unlike some feedback adjustments Ive tried, the Bravo 2.3s didnt harden the sound when I applied more feedback. Too bad the remote didnt offer control of the feedback setting; it would have been much easier to optimize if it had not been necessary to get up, adjust the control, sit down, adjust the volume, and then assess the effect of the new setting. Although rated at only 6Wpc, my reference Art Audio PX-25 amp has a wide frequency response, and within its conservatively rated power output, deep and punchy bass. I attribute that to the quality of its massive transformers, one of the reasons for the amps $7150 price. But the actual cost for this comparison didn't stop there. To compare like to like, I also pressed my Audio Research LS26 preamp ($5995) into use. Comparing a $1949 integrated amplifier to a $13,145 power amp/preamp combination was not really fair, but then I thought that its equally unfair to compare a 6Wpc amplifier to an 18Wpc unit. One of the glories of the PX-25/Audio Research LS26 combination is an immense, wide-open soundstage that portrays performers location quite precisely, both horizontally and in terms of distance. This was a definite improvement over the Bravo 2.3's handling of depth. The combo also exhibited a very slightly wider frequency response, along with massive dynamics and engaging tonality. The sound was better, no doubt, but the Bravo 2.3 wasnt outclassed by the comparison. In fact, if I tell you that the amp/preamp combination sounded better than the Bravo 2.3, I doubt youd be surprised; but if I say the Bravo 2.3 achieved 90% of the PX-25/LS26s sound for 15% of its cost, that should be doggone amazing. The Law of Diminishing Returns was definitely hard at work here, and was greatly in the favor of the Bravo 2.3. The JAS Audio Bravo 2.3 integrated amplifier displayed sumptuous tonality that depicted instrumental and vocal sonorities with great detail and beauty. With it in my system, music was infused with life and energy -- no smearing or plodding here. While the Bravo 2.3 may give up a smidgen to far more expensive gear, at its price its quite remarkable. Ive reviewed several integrated amps, but the Bravo 2.3 compares favorably to the best of them. Like most SET amps, it wont drive just any pair of speakers, but speakers of 94dB or higher sensitivity should be compatible. Of course, if you have a large room and like to play music really, really loud, a higher-powered integrated amplifier might be a better choice. The Bravo 2.3 was a little finicky about the speaker cables used with it. Both I and the amps importer found the recommended silver cables to be somewhat bright, but then youd probably not use silver cables anyhow, due to their expense. Some experimentation with cables may be necessary to dial in the amps frequency balance in your system. I might wish the remote control had a little more flexibility, but volume control is the only really essential remote function, and the Bravo 2.3s tiny remote performed that operation flawlessly. With its attractive appearance, rock-solid construction, and alluring sound, the JAS Bravo 2.3 integrated amplifier is the best low-powered model Ive heard in its modest price range, and it competes surprisingly well with much more expensive gear. 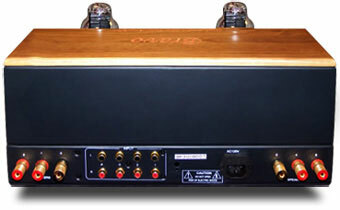 It has made me eager to audition more amplifiers that use the 6C33 tube. Bravo, JAS Audio!